American Baptist Clergy who have served or are serving in ministry in Massachusetts. You don’t have to struggle with finding financial aid any longer with grants from Massachusetts Baptist Charitable Society. We provide financial assistance and grants to members of the Massachusetts American Baptist clergy and their immediate families. 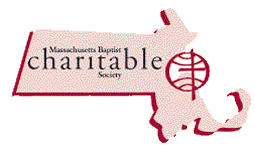 When it comes to giving back to your church community the Massachusetts Baptist Charitable Society provides support for current and retired American Baptist Clergy. When you need assistance finding financial aid and grants, the Massachusetts Baptist Charitable Society is here to help. Our focus is on providing grants for American Baptist Clergy and families who have served or are serving in Massachusetts. For more than 200 years, the Charitable Society has been providing aid to the vulnerable among American Baptist clergy and their families -- the widows, widowers and children of those who have faithfully served ministries in Massachusetts.